April 2019: yes, we still have some sets available! 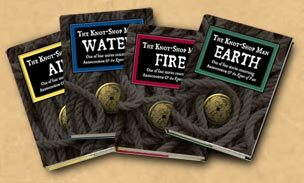 The Knot-Shop Man is a set of four books. They’re hand-finished, numbered, signed, and bound with a very particular knot. This is the special limited edition of 200 sets, celebrating the tenth anniversary of Planetarium. Specifically, each set of this limited edition contains four hardback books, about 5½" x 8" in size, each 160 pages long, printed on 150gsm silk stock. There are some black-and-white illustrations, but this is fundamentally a written-word project. Unlike previous Beholder books this is not a graphic novel or cartoon. The Knot-Shop Man is only available here on the Beholder website, where you are buying directly from Exploding Pen Ltd. (which is Beholder’s tiny but successful publishing arm). If you want to understand more, read the "about the project" page — basically, because we’re selling at cost (and the books are expensive enough as it is), we simply can’t trade wholesale with our usual retailers. Or, to put it another way, if you think you’ve ordered a set through Amazon, you’re going to be disappointed: they list the books on their site even though they have never stocked them. A set of The Knot-Shop Man books costs £50 — postage is extra, unless we can arrange a delivery by hand before you buy (if you’re in the UK, ask first: it’s often been possible!). Any questions, get in touch. International buyers: be sure to read the note on postage below. Sets are scarce. If you really want to buy two, order twice. Postage charges! The spectacularly high figures for international postage are the Royal Mail’s prices (we based these prices on 2009 rates, and the set being around 1.8 Kg, but actually it’s over 2Kg). Sorry. More to the point, this makes this edition impractical to post air mail to some overseas destinations (for example: we can’t ship to Canada, sorry). The problem is that we can’t split the pack to be light enough to come within some Air Mail regulations. So far, we’ve confirmed that USA, Australia and Europe are not a problem, but if you’re a long way away and not in those regions, you must check with us first to see if we can post to your location. There are three ways to pay. The first two are the most convenient. Make sure you choose the right kind of delivery! International readers: be sure to read the note above on postage prices before you buy — otherwise we may be unable to fulfil your order. If you’ve got a UK bank account and would rather pay from that, send a cheque (to this address) made out to Exploding Pen Limited. If you’re going to order by post like this, please send an email letting us know you’ve sent your cheque so we can have your books ready. Be sure to tell us the address to which the books should be delivered. If you’d prefer to transfer funds directly, contact us for our bank details. If you’ve got four coins, each with two six-fingered dragons and a hole in the middle, you can pay with those. Take them to Mama Musubi’s mobile kitchen on the Tangled Plain and tell her Beholder sent you. You’ll probably get a bowl of noodles for your trouble too, with a knot tied in every one. We will email you as soon as your books are despatched. Usually we send books out by return.